The video recording industry has changed dramatically over the years. Film has given way to digital formats, placing greater importance on the need for high-quality acquisition media. As such, many high-performance cameras require users to install a quality solid state drive to ensure that video is captured correctly and that no footage is lost during the process. Camera manufacturers often hold high standards when it comes to approving SSD brands for use with their hardware – after all, certifying an inferior product would reflect poorly on their market standing. That’s why it’s always a big deal in the video recording world when a manufacturer places its seal of approval on a new storage device. Australia-based camera manufacturer Atomos recently added DIGISTOR SSD drives to its stable of highly recommended storage devices, recognizing the products’ performance and functionality. Atomos is devoted to the development of high-tech solutions that benefit their customers, so any approved drive needs to adhere to those same principles. 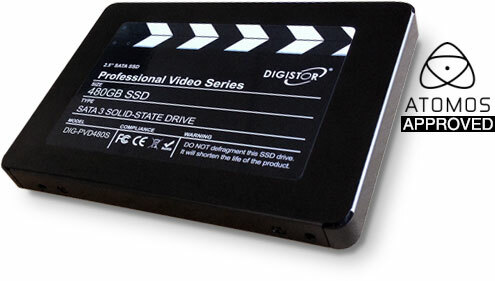 DIGISTOR Professional Video Series SSDs have been specifically designed for video capture, making them ideal solutions for filmmakers and other users who are absolutely serious about their acquisition media needs. Many SSDs on the market have been created with other uses in mind, such as supporting Netbook PCs. Because these products have been designed for broader applications, they are often unsuitable video recording purposes. DIGISTOR SSD drives are engineered to adhere to industry standards, sculpted to meet form factor specifications and configured to match widely used video formats. This enables DIGISTOR to offer video professionals what is essentially a plug ‘n’ play solution, eliminating potential headaches and streamlining the installation process. Atomos has recognized that dedication to quality and ease-of-use, listing DIGISTOR Professional Video Series SSDs as “highly recommended drives” for use with the manufacturer’s products. Only a small handful of SSDs have been given this distinction, making DIGISTOR a member of an elite group of acquisition media vendors. This latest distinction follows DIGISTOR’s long-standing position as a trusted provider of SSD drives compatible with Blackmagic Design hardware. By focusing efforts on specifically tailoring storage devices to the specific requirements of video capture applications, DIGISTOR has created the most effective and reliable SSD on the market for professional-level recording. Filmmakers, videographers and other production crew members who leverage only the best cameras available shouldn’t settle for inferior storage drives. DIGISTOR has the track record of success and distinction to demonstrate that it provides the most consistent and durable SSDs for video use on the market.